Grow your own with this compact system, perfect for the urban gardener. Why hydro instead of soil? Growing hydroponically has tons of advantages. It actually saves water! This project uses the same 5 gallons of water over and over again for a whole week. If you were watering into dirt, it would be difficult, if not impossible, to collect and recirculate the water. Hydro also saves space. In a typical soil garden, the lettuce plant will only grow as big as the 4″ pot will let it. With hydroponics, the roots of the plants will actually grow right out of the pot, allowing the plant to get as big as it likes. Or at least as big as it can before you eat it! Growing tray (1) A 12-gallon under-the-bed plastic storage bin works perfectly. 2. Choose a flood table. 3. Add the drip emitters. Step #1: Start the seeds. Place 2–3 seeds (lettuce, in this case) into a moist seed-starting cube. Fill each cube. I used a seed starting kit, with a tray and lid, but it’s not necessary. Set them in the sun, being sure to choose a place safe from slugs and birds. In 1–2 days, the seeds should sprout. Water them as needed until they grow leaves. When the leaves are looking sturdy, carefully lift the cube to check for roots poking out from the bottom. When the roots are vibrant and the plant seems strong, it’s time to transplant. This first step should take 1–2 weeks. Step #2: Choose a flood table. This system is the simplest version I could design. If you are serious about hydroponics, consider purchasing a readymade flood table, which is built to fill and drain, and can easily be automated with a pump and timer. This system uses a homemade flood table that’s hand-filled with water. The amount of water used in this project is 5 gallons, so choose a container for your flood table with a capacity of 10gal–12gal. The goal is for the water to reach about halfway up the sides of the 4" pot when the table has been filled. Step #3: Add the drip emitters. Drip emitters are great little tools. Found in the irrigation supply section of most hardware stores and nurseries, they do just what you think: drip. They are rated based on their maximum gallons per hour (gph). For this project, the goal is for the table to hold 5gal of water for about 1 hour, so I used 2 drip emitters that are each rated 2gph. In determining where to place the drip emitters, consider where you’ll set the growing tray, and in turn, where you’ll place the bucket. This example uses a stool to hold the tray, and the bucket fits under the edge. To easily make a hole in the tray, use a hot nail. Hold the nail with pliers, and then heat it until it’s very hot. I used my stove’s gas burner. Once the nail is ready, puncture 2 holes in the bottom of the tray. You can always make the hole wider, so start with a small hole, and see if the end of the emitter fits inside it. Scrape the melted plastic away with a sharp knife, and then sand it with fine-grit sandpaper to make it smooth. Push the emitter into the hole. If the emitter doesn’t seal completely, it’ll be fine. But if the water gushes out really fast, try sealing it with epoxy or hot glue. Step #4: Mix the media. Plants grown in soil develop roots that uptake nutrients and minerals from dirt. When plants are grown hydroponically, they are grown in a sterile medium and fed only with a water and nutrient mixture. To maximize your plants, they must be potted into a mixture of media that will serve the plants in 2 ways. First, the mixture must hold a good bit of moisture, but not too much moisture. Second, it must allow plenty of air to circulate around the roots, because roots heart oxygen! If the mixture is too dry, the plants will starve and wilt. If the mixture is too wet, the roots will rot. To give your plants the best of both worlds, use a base of dry, air-holding perlite and then add a portion of water-holding rich coco fiber. Vermiculite and peat moss are acceptable substitutes, respectively. If your climate is arid, add more coco to the perlite. If your climate is humid, add less. If you have a wet mix, water less. If you have a dry mix, water more. In Northern California, where this garden was grown, the mix used was 8 parts perlite to 1 part coco. Make sure that the 4" pots you use have numerous holes in the bottom. The plants will wick food and water through these holes. If necessary, poke holes in the plastic. Fill the bottom 1/3 of a 4" pot with media. Gently place the cube and its start in the pot, then add media all around the sides and top of the plant until it’s snugly in place. Water the plant to finish the process. Set each pot into the flood table. Step #6: Mix the nutrients. 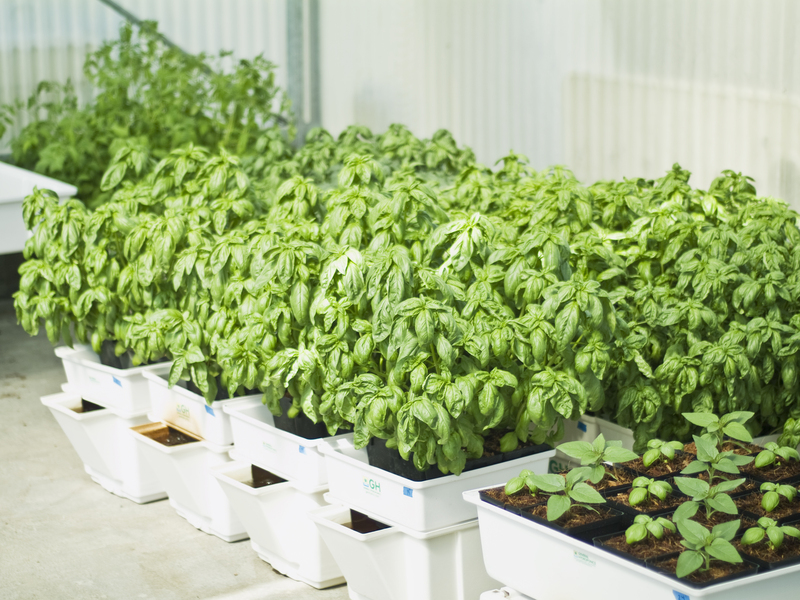 Fertilizer for hydroponic gardens can be confusing, so keep it as simple as you can. This garden uses Alice’s Garden All Purpose Plant Food. You can also try FoxFarm Liquid Plant Food, and the Flora Series from General Hydroponics. Plants grown hydroponically need all of their nutrients to come from the water. They require 2 types of nutrients: macronutrients (nitrogen, phosphorus, and potassium) as well as micronutrients (molybdenum, zinc, cobalt, manganese, and others). Since this garden just grows lettuce, herbs, and small veggies, avoid complicated formulas, but be aware that not all fertilizers are suitable for hydroponics. They must offer both micro- and macronutrients. Fill the 5gal bucket with water. Add the fertilizer per the instructions, and mix thoroughly (Figure H). Step #7: Feed the plants. Pour the bucket of mixed plant food into the tray, slowly. The food isn’t poured onto the plant directly; it’s poured into the tray, and it wicks up into the roots of the plant through the holes in the bottom of the 4" pots. Set the bucket under the drip emitter to catch the water and nutrients as they drip out (Figure I). Step #8: Maintain and harvest. Once the water has dripped out of the tray and back into the bucket, cover the bucket with its lid, as the plant food is photosensitive. Water the plants every day. If they seem wilty, water them twice daily. The mixed nutrients will be eaten by the plants, and the water will also be consumed, so add more water to the mixture in the bucket as necessary. If the plant food starts to get a funky smell, make a fresh batch. Otherwise, replace the nutrient and water mixture every 7 to 10 days. When the lettuce is mature, make a huge salad, and then start your garden up again! This project first appeared in CRAFT Volume 09, page 58.